Because I am crazy, and because I earnestly desire to drink deeply from God's well of living water, I have committed to memorize the book of Colossians in 2011. The idea is, "Committing hearts to him and his words to heart." In an auspicious beginning, I have memorized four verses so far. 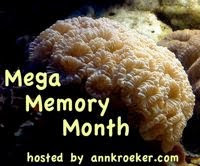 Those of you participating in Mega Memory Month with Ann Kroeker are probably way ahead of me. But I am running a marathon, so I concede the sprint to you. So far, I have not needed any special memory tricks. I have also not received any special epiphanies. But it will happen. I also expect to start needing memory aids by next week, if not in the next two days. In related news, two days ago I finished reading my way through the Bible, cover to cover. It took me 106 days instead of the goal of 90, but was my best finish ever. It impacted me so much I started again yesterday, on a 350 day pace. What other job exists for the follower of Jesus, than to drink deeply of Scripture and be changed by it? All I can do is encourage those journeying through life alongside me to pick up the challenge. Drink God's Living Water. Hi Krista, I'm stopping by from MMM! I think that is fantastic that you are going for memorizing the book of Colossians. Keep up the good work! I love your comment at the end of your post where you said..."What other job exists for the follower of Jesus, than to drink deeply of Scripture and be changed by it?" So true. Keep drinking deeply of His Living Water! Keep moving steadily along on the marathon--but you've got me on the Bible-reading sprint! I'm plodding along on the Bible reading while trying to pack in the memory work. I celebrate it all--God's Word is being taken in, one way or another. Isn't it Martha Stewart who says "It's a good thing"? Well, it--God's Word taken in--is a *very* good thing.